Got a closet full of games and toys that you're ready to trade for other, different games and toys? Want to get a great deal on someone else's barely-used merchandise? 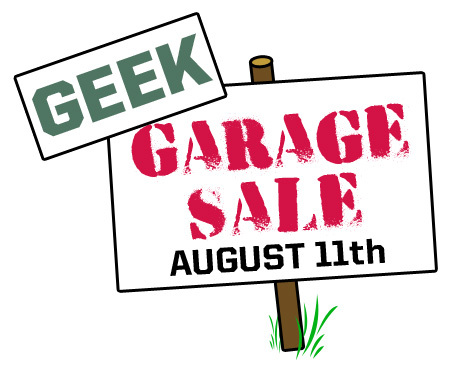 Come out to our Geek Garage Sale to find new-to-you treasures or turn your spare items into Atomic Empire store credit! Sellers may reserve a four-foot space with one chair for free! Upgrade to eight feet of table space for $10. Bring anything to sell as long as it fits our themes of comics, games, toys, and general-geeky-interest items. You decide what your stuff is worth and can adjust prices or haggle at your discretion. Buyers will purchase $1 garage-sale tickets from the store and may exchange the tickets for merchandise at the seller tables or use them to enter raffles for door prizes. No cash may be used to purchase Garage Sale items. Any time on August 11th, tickets may be redeemed at the counter for a gift card of equal value (so 10 tickets can be redeemed for a $10 gift card). Tickets have no value after August 11, so make sure to redeem them! Space is limited, so register for a table today! A four-foot sales space is 100% free of charge. Limit one table per household. Table upgrades for 8 feet are SOLD OUT!